Seeing Adolf Hitler’s vaginal headed high school marching band from hell stomping across the surface of Mars trying to trample a space baby to death is not your everyday film imagery. 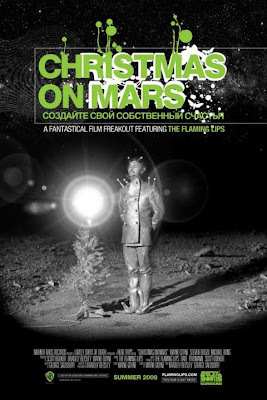 But somehow it doesn’t feel all that out of place in the Flaming Lips newly released film Christmas on Mars. The Kubrickean sci-fi film, which was written and directed by Flaming Lips lead singer, Wayne Coyne, features the entire band as cast members as well as appearances by Adam Goldberg and SNL comic Fred Armisen. The film’s art house nature and off the wall plot about the first Christmas on a manned Mars settlement makes for an instant cult classic. The project, which took over seven years to produce, was based on a childhood experience Coyne had with his mother as well as one of the Christmas cards the band created for its fans. The campy B-movie feel of the film fits well with the very loud and, at times, abrasive score created by the band. Although the acting and gratuitous expletives are at times unbearable, the bizarre twists, intense music and an absurdist sense of humor make it watchable. One of the movie’s strengths is its gritty cinematography, which intercuts scratched up black and white footage with bright color images. Besides being a must see for any Flaming Lips fan, the film is highly recommended to fans of off- beat cinema with its echoes of David Lynch and 2001: A Space Odyssey.